Trawler Skills has been created to offer insights and recommendations for current and future trawler owners. This section is trawler-centric, but much of what is covered should be relevant to most power and sail cruisers. Proper preparation should include a basic understanding of many topics such as; safety, first aid, navigation, weather, underway performance, anchoring, docking, dinghies, engines, generators, fuel management, electricity, running at night, heads, plumbing, cooking, maintenance, standing watch, engine room checks, etc. There are a seemingly unlimited number of details to attend to…every day can reveal new projects requiring special talents. We are highlighting some of the responsibilities we find prepared owners consider important through our series of videos and collection of documents. At JMYS, our focus is trawlers and our clients are our priority. We are in a relationship business; working with sellers to promote their trawlers and guiding our buyers to acquire trawlers. For buyers, our after-sales support is unique in the yacht sales industry as we believe that an important part of our yacht broker duties should be to include training and familiarization after closing. Our indoctrination approach has been organized to enable you to more quickly adapt to your role as an owner/operator. JMYS has no intentions of becoming a trawler school (there are plenty of good sailing and seamanship institutions available that we can recommend) and we are not all licensed captains (we can suggest quite a few accomplished captains who can run deliveries and supplement your education). One of our immediate objectives after your trawler purchase is to serve as your training coach using our product knowledge and years of on board experience to provide you with a detailed orientation of systems and equipment. 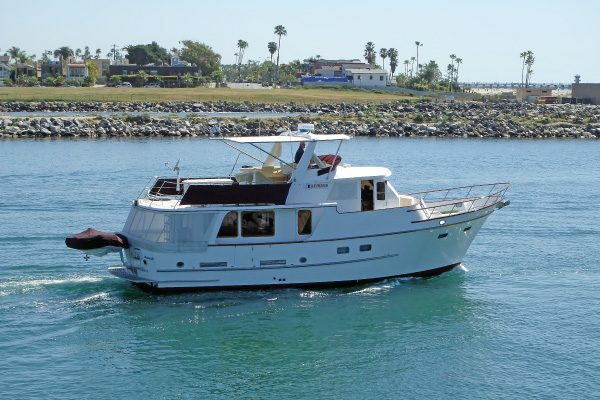 Spending time with you aboard your trawler, conducting hands-on, one-on-one instruction, has proven to be the most effective way for our clients to successfully embrace trawler ownership. We benefit too, becoming better yacht brokers by working closely with you and sharing what we know (while learning from you as well!). During the past twenty-five plus years selling and cruising aboard new and used offshore vessels, Jeff has developed a proprietary teaching curriculum that includes organization, training, planning, check lists, practice, procedures, labeling, etc. This love of coaching goes back to his teenage summer vacation employment as a sailing instructor and has remained important to him throughout his marine industry career. Our techniques are constantly refined and improved. We know each of our clients has a different boating background along with varying concerns and we are very aware that every individual learns at their own pace. We customize our instructional content with flexibility to cater to your priorities, to practice those things that you want to improve, all with the end result to better prepare you to be a capable trawler owner. Our lessons are especially helpful for couples as we want both of you to have a broad understanding of the big picture as well as a general appreciation for a wide variety of important skill-sets. We expect that you will naturally gravitate to roles you are most at ease with. We find that most couples divide up responsibilities with one of you better than the other when it comes to projects like: cooking in the galley, driving the boat back into the slip, computer navigation planning, tracking the weather, doing maintenance in the engine room, etc. That is a natural division of labor, but we recommend that both of you be acquainted with chores that are not your specialty. We encourage our trawler owners to strive for self-sufficiency. You are responsible for the safety and well-being of your crew AND your trawler. There may come a time when you need to single hand your trawler, so it is essential to become comfortable and know that you are ready. Increasing confidence in your abilities and proficiency to perform various tasks on board will allow you to better enjoy the freedom and independence that the trawler lifestyle affords. One of the most fascinating aspects of owning a trawler is realizing that there is always something new to learn. Even veteran trawler owners freely admit that their knowledge base is continually evolving as they develop new trawler skills. The materials shared here are presented to both introduce new concepts and reinforce your know-how. We welcome your feedback on what you would like to see included. Please check back regularly as we continue to add new material.